for the kidlets. That is why they are warped. "I wanna kill, kill, kill" was their favorite. Hmmm!! back in 71-72 I had a friend who looked and sounded like Arlo Guthrie. Well, like a cross between Arlo and Charles Manson, really. But Bill was a sweet and talented guy who would serenade us all on demand with "Alice's Restaurant" on many strawberry candle scented, tie-dyed and blacklit evenings. And I still have a turntable. My own tradition for when I miss it on the radio. The next best concert was two years ago when Donovan was here on Long Island and he sang EVERYTHING he did and as I type now there is a BMW (oops no it was Mass Mutual) commercial with my favorite, "Catch The Wind" which of course had lots of meaning for me bu besides that, a great song. The music of that era was the best and I too have the vinyl of Alice's Restaurant. I also have the double album by Arlo and Pete Seeger, a treasure. Arlo made his dad Woody very proud. He sang everything well. I can only remember "Alice's Restaurant" and the legendary Steve Goodman's "City of New Orleans." Do you remember that Alice's Restaurant is the exact duration as the gap in Nixon's "Watergate Tapes?" Although way to the left of you, a Cesar Chavez Democrat, thanks for the decent, honest and sometime heart felt posting all those years. Let's hope the country will get asap out of the black hole we are in. Let's hope that everyone who wants it and able to work will happy a decent meal and a roof over their head. I've been here a relatively short time, but you feel like extended family! of the cookbook and a recording on vinyl. My wife of 38 years bought both before we were married on Thanksgiving Day in 1970. We also have a clipping about Alice from the Washington Post printed in 1978. Had I known that littering could have kept me out of the draft, I might have tried that instead of joining the Navy and serving on two deployments to the Tonkin Gulf. One thing I noticed is that the link to play the song is supposed to be enabled today but is not. to Jeralyn TChris, John Hall and TL readers. And for everyone who comments here, whether we agree or not. I thank everyone especially for putting up with me, as I can be a royal pain. Best wishes for you and your loved ones. Thanks to Jeralyn, BTD, TChris and everyone else for keeping this place hoppin'. If that isn't flat out stupid, I don't know what is. My niece had drug problems, I think only juv offenses, but she went through rehab, has always been a good worker and is now back in school working on her nursing degree. Her uncle is helping with tuition. I'll have to ask her about financial aid. Why anyone would stop bright productive people from improving their lives after taking the wrong path is a mystery to me. My niece is very good with home care patients she works with and is/will be quite an asset to others in the future. with my boys. Good old WMMR, 93.3 in Phila. We sang it, loud, cause we want to end the war. I guess we're part of the movement. you can buy one here on EBay for $45.. I work in the same building as a radio station, and was told (a little tongue in cheek, of course) that the "Alice's Restaurant" tradition started because it was so long it gave the DJ a chance to scarf down a whole bunch of Thanksgiving food. I haven't watched the Macy's Day Thanksgiving Parade in years. What a weird thing this is. The link to downloadable song doesn't work (the link is there, but says "music only available on Thanksgiving"). Anyone else have a source for an MP3 of this? I want to stick it on a flash drive and play it for my kids as we're driving this afternoon. ...but the copy I got was supposed to be 17.0Mb, ended up 14.1Mb, 15:23 instead of 18:00. The upside is that's 15 min more than you have now. For those here now and unable to find the full version it will play in 10 minutes. Alice is now, but--such an interesting life. As she says, I've done many things, including running that restaurant. 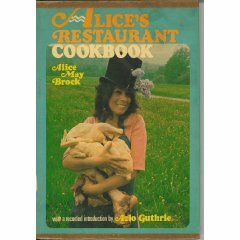 Alice's Restaurant is a nice marker. Nostalgic. "We plow the fields and scatter, the good seed on the land." Seems like it would be better for springtime, imo. Do farmers plant stuff in November too? Lincoln's Thanksgiving proclamation. Now I'm thinking of all the hymns we Midwestern Protestants sang at the community service on Thanksgiving morning. In a Methodist church, no less. Apparently a recording artist named Stephen Scwartz claimed this lyric for his own. P.S. Erica Jong has a funny, nostalgic column on Huff Post. She includes Hillary Clinton in her list of people for whom she is grateful. The sowing bit was a prelude to harvest. Did not get that far when I googled the tune. Makes sense as a t'day song now. Bet they were singin this to the injuns back when. NYT? Apparently my education alot of revisionist history. Did not know about the Huguenots. Too bad, I guess. P.S. I miss Buchwald today. Kept some of us from going off to the loonie bin. this DK diary BTD linked to yesterday? I will go to the Orange because you told me. Here I go. the version from the link was in the same league as the original until it got to the added part with Clinton, Carter, and Nixon and that was flat out funny. Alas, the cookbook, complete with kidley bean joke, went missing during one of many moves over the years. First heard the song in NYC (The Village Gate?) many, many years ago. Laughed my head off while trying to explain to my now spouse about the traffic cop in front of the Red Lion Inn, the blind judge in Lee and the weird little restaurant in Stockbridge that we poor people frequented in the mid-60s. Every noon on Thanksgiving Day for many, many years a radio station in the Boston area plays the song. We timed it perfectly today. Drove into my brother's driveway just as the song ended. I worry a little that the horror at the mere thought of war exemplified in the song might have been lost somehow in our eagerness to support our soldiers in their current conflicts. I've sort of lost track of Arlo. Maybe it's time for him to prod us into awareness again of what war really means.